Whilst many makers tinker around with materials and bracing to shape an instruments “voice” all my guitars are braced for maximum output without compromising structure. Where they differ from one another, and how the “voicing” occurs is down to the physical shaping, or arching the soundboard is placed into. The “topography” if you will. 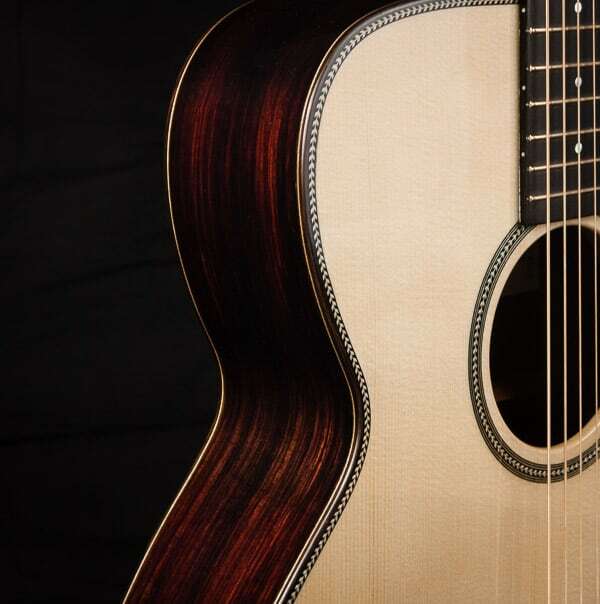 A flat soundboard sounds very different from one which is curved – it has a different character and colour. And different curves have different sonic qualities. So I now offer three distinct designs – the HO, the SS and the SK. So a Model C with a “standard soundboard” is a Model C-SS, but a Model C with a “cylinder top” is a Model C-HO. A Model C with a flat top and satin finish is a C-SK. Likewise a Model S with a “cylinder top” is a S-HO, with a “flat top” it would be a Model S-SK. First comes the body shape (C, S or D) then the soundboard design – HO, SS or SK. The origin of my “standard” soundboard design (SS design) can be traced back to my many years spent in the Sobell workshop, however many aspects – thicknessing and bracing have gradually evolved to suit my tonal and structural preferences and reflect years of careful, honest observation. 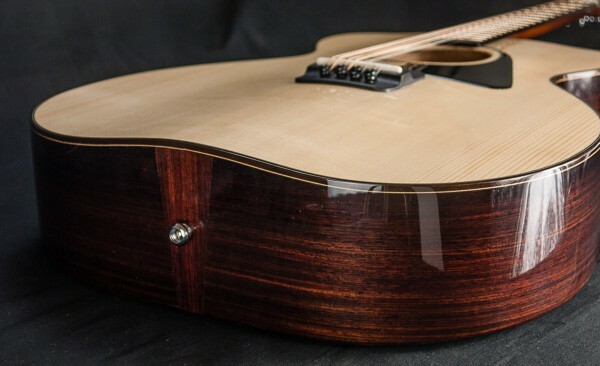 The “standard soundboard” is considerably more curved than a conventional steel string guitar and the ribs are fitted to meet the back and top perfectly – the plates are not “pulled” to meet the ribs as is common. 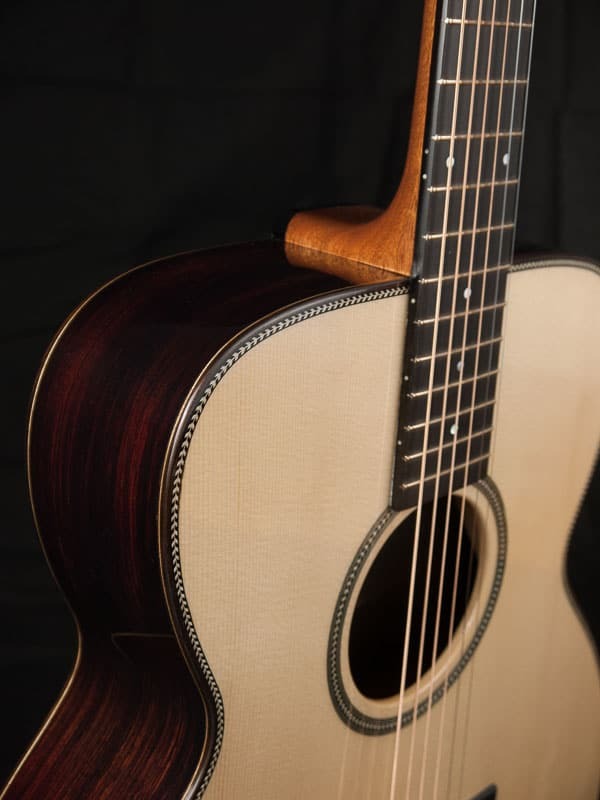 Ladder braced cylinder top guitars were first created in the 1890’s by the Howe-Orme company of Boston. My cylinder top guitars (HO models) are X braced for a more modern sound and more sustain. The design tends to make for very loud, clear sounding instruments. 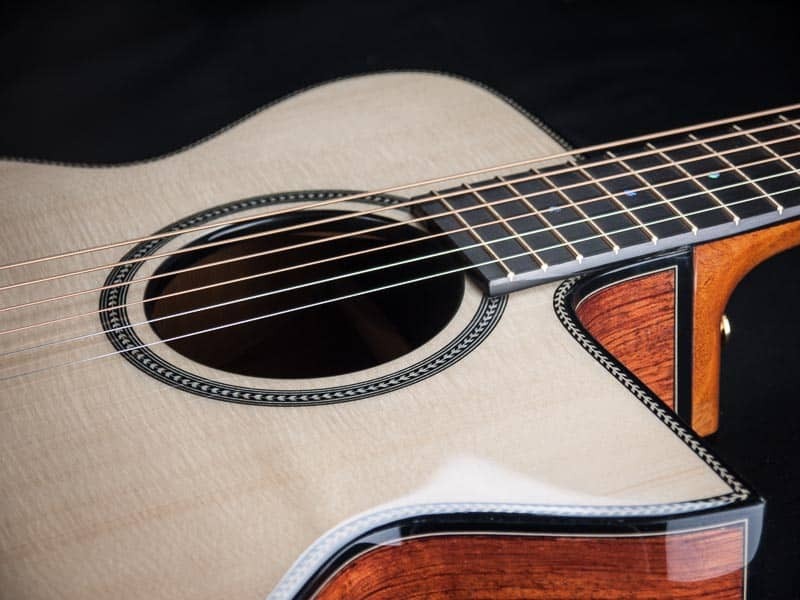 The cylindrical arch combined with the X brace makes for a very strong top so the soundboard mass can be dramatically reduced, by around 40% compared to a conventional steel string guitar. This is an fantastic “forgotten” design, that I’ve developed into something really rather special. Most guitars have flat soundboards so you could say its a surprise that it’s taken me about 28 years to start making guitars with flat soundboards! That’s because I’ve only recently understood how to make them in such a way that they wouldn’t distort like most flat top guitars do. It’s easy to prevent “bellying” as it’s known by over bracing the top, but then you’ve made a guitar that can’t sing. So you have to make a soundboard that is both strong and light. It’s tricky…. So what I’ve come up with is a soundboard design that has more bass than my “standard” or “cylinder” top design, yet still has the clarity normally associated with my work. The flat top design can be found on my Session King tenor guitar (T-SK) and the more refined, high gloss flat top (SKadv) designed instruments.